Würth, R., Pattarozzi, A., Barbieri, F. and Florio, T. (2018). Primary Cultures from Human GH-secreting or Clinically Non-functioning Pituitary Adenomas. Bio-protocol 8(7): e2790. DOI: 10.21769/BioProtoc.2790. Pituitary adenomas are among the more frequent intracranial tumors usually treated with both surgical and pharmacological–based on somatostatin and dopamine agonists–approaches. Although mostly benign tumors, the occurrence of invasive behaviors is often detected resulting in poorer prognosis. The use of primary cultures from human pituitary adenomas represented a significant advancement in the knowledge of the mechanisms of their development and in the definition of the determinants of their pharmacological sensitivity. Moreover, recent studies identified also in pituitary adenomas putative tumor stem cells representing, according to the current hypothesis, the real cellular targets to eradicate most malignancies. In this protocol, we describe the procedure to establish primary cultures from human pituitary adenomas, and how to select, in vitro expand, and phenotypically characterize putative pituitary adenoma stem cells. Pituitary adenomas are among the most common intracranial neoplasms (up to 15%) and cross-sectional studies have found a prevalence of around 90 cases per 100,000 inhabitants, with the vast majority being adults over 30 years old. Approximately 10% of unselected pituitaries examined at autopsy (i.e., considering also the pituitaries of subjects without previous diagnosis of pituitary disease) have developed adenomas (Molitch, 2017). Although often benign tumors, the management of pituitary adenomas can be complicated by the clinical syndromes related to hormone hypersecretion, or by the development of aggressive behavior characterized by resistance to treatment, high proliferation rate, rapid recurrence and extrasellar invasion (Carreno et al., 2017). The persistence of stem cells in adult pituitary (Florio, 2011) led to the hypothesis that the development of pituitary adenomas (and possibly of other benign neoplasia) can derive from subpopulations of tumor cells endowed with stem cell properties (mainly self-renewal and differentiation ability), as already established for malignant solid and hematologic tumors. Recently experimental evidence showed that cancer stem cells (CSC) paradigm also applies to human and mouse pituitary adenomas (Donangelo et al., 2014; Peverelli et al., 2017; Wurth et al., 2017), and it was proposed that oncogenically-transformed CSCs can originate the tumor, clonally. The concept of CSC as tumor-initiating cells (TICs), initially developed for malignant neoplasia, proposes that only a subset of tumor cells, the CSC subpopulations, is responsible of initiating and maintaining tumor growth, causing invasiveness and the formation of metastasis, and conferring drug resistance (Clevers, 2011; Florio and Barbieri, 2012). This theory, leading to a cell hierarchy within a given tumor, replaced the stochastic model of cancerogenesis that proposed the bulk of solid tumors to be composed of cells showing equal tumorigenic potential. A more recent evolution of the CSC model is the ‘dynamic-stemness’ theory, which postulates an interchange between CSCs and more-differentiated (progenitors) cells, determined by epigenetic and microenvironmental signals, transcription factors, miRNAs or the activation of oncogenic pathways (Li and Laterra, 2012). Besides the relevance from a theoretical point of view, the identification of putative CSCs in pituitary adenomas could represent the basis to identify possible novel pharmacological targets to treat pituitary adenomas, in particular for the more aggressive and poorly responsive subtypes. Primary cultures from human pituitary adenomas have been used since long to study genetic and pharmacological features of these cells, but the definition of the presence of CSCs within pituitary adenomas raises the issue of their identification and isolation within a non-selected culture, and expansion in vitro to allow genetic, biological and pharmacological studies. In this protocol, we describe the procedures to establish primary cultures from human pituitary adenomas and to select and expand in vitro putative CSCs (Wurth et al., 2017). Experimental data from their characterization are also reported. Wrap clean scissors and forceps in an aluminum foil and autoclave them. Sterilize the tissue culture hood room by UV light for 30 min. Prepare two 60 mm dishes, pipette 3 ml cold sterile PBS to each dish and place them in the hood. Unselected tumor samples were obtained from patients who underwent surgical treatment at the Neurosurgery IRCCS-AOU San Martino-IST, after patients’ informed consent, and Institutional Ethical Committee approval. Neurosurgery team placed a portion of the resected tumor in a 15 ml Falcon tube containing 5 ml PBS to be delivered to the lab, to be immediately processed for primary culture’s establishment. Available samples are generally very small (also considering the pathologists’ requirements for diagnosis) but few mm3 are usually enough to isolate putative CSCs. Note: The sample has to be collected and maintained at 4 °C. Note: All steps should be performed under sterile conditions. Clean the transport tube with 70% ethanol; transfer the tumor tissue to the 60 mm dishes in the hood (Figure 1). Figure 1. Pituitary adenoma tissue dissociation. Representative pictures showing different steps of the protocol aimed to obtain a primary culture from post-surgical human pituitary adenoma samples. From left to right: adenoma samples are initially cut into small pieces with a scalpel, mechanically dissociated in single cells by repeated up-down pipetting, and filtered through 100 μm cell strainer. The last picture on the right represents the morphology of freshly dissociated pituitary adenoma cells (original magnification 10x). Please note that human pituitary adenoma fragments that reach the lab are variable in size from case to case and usually very small. Using small forceps and the scalpel dissociate the tissue in small fragments (about 2 mm3): sample has to be mechanically dissociated under sterile conditions to obtain single cell suspensions (Figure 1). Note: Mechanical dissociation is usually enough to obtain in short-time single cell suspensions (see, for example, Florio et al., 2003). 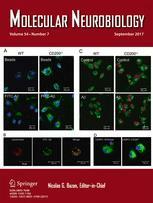 Enzymatic dissociation by trypsin (Schettini et al., 1990) or collagenase (Peverelli et al., 2017) was reported in different studies using both rat and human pituitary adenomas, respectively, but according to our current experience, this is not a necessary step when stem-like cells are isolated. Filter the cell suspension through a PBS-prewet 100 μm cell strainer placed on the top of a 50 ml tube (Figure 1). Smash any residual clumps with a 1,000 μl tip, and wash with 1x PBS twice (three times, 3 ml each). Centrifuge the cell suspension at 300 x g for 5 min at room temperature (RT), and carefully discard the supernatant with a 10 ml pipette. Lysate red blood cells (using Ammonium-Chloride-Potassium (ACK) Lysing Buffer, Lonza); add fresh PBS, and centrifuge the cell suspension at 300 x g for 5 min at room temperature (RT), and discard the supernatant. A representative picture of the obtained cell suspension after tumor dissociation is depicted in Figure 1. To purify pituitary adenoma cells from fibroblasts, add 80 μl of buffer for magnetic cell separator (Recipe 1), pipette a few times until the cell suspension is homogenous, then add 20 μl Anti-Fibroblast MicroBeads, pipette a few times (Figure 2A) and incubate for 30 min at room temperature. Add 5 ml of fresh buffer for magnetic cell separator and centrifuge at 300 x g for 5 min. In the meantime, clean with 70% ethanol the MACS Separator and arrange it under the biological hood. Place an LS column in the MACS Separator (Miltenyi Biotec, following the manufacturer’s instructions) and apply 2 ml of buffer on top (Figure 2B). As soon as the buffer completely run through, place a new 15 ml tube under the column, resuspend the cell pellet in 1 ml of buffer, and perform the magnetic separation adding the suspension to the column and collecting the effluent. Rinse the column with 1 ml buffer (3 x). Figure 2. Removal of fibroblast contamination from pituitary adenoma cell suspension. Add 80 μl of buffer for magnetic cell separator to pituitary adenoma cells, pipette a few times to make cell suspension homogenous, then add 20 μl Anti-Fibroblast MicroBeads, (A). After a brief incubation at room temperature, add 5 ml of fresh buffer and centrifuge at 300 x g for 5 min. In the meantime, clean with 70% ethanol the MACS Separator and arrange it under the biological hood. Place an LS column in the MACS Separator and apply 2 ml of buffer on top. As soon as the buffer completely run through, place a new 15 ml tube under the column, resuspend the cell pellet in 1 ml of buffer, and add to the column to perform the magnetic separation (B). Collect the effluent with the purified cells. Collect the negative fraction (adenoma cells) in a 15 ml tube, add fresh PBS and centrifuge at 300 x g for 5 min. Optional: To recover pituitary adenoma-associated fibroblasts (cell fraction bound to the beads), remove the column from the separator, place it on a new 15 ml tube, add 3 ml of buffer and flush out the magnetically labeled cells using the plunger supplied with the column. Resuspend cell pellet in 500 μl of pituitary adenoma stem cell medium (pre-warmed at 37 °C in water-bath) (Recipe 2). Plate each cell suspension (500 μl) in a well of MWs 24. Culture the cells at 37 °C, in a 5% CO2 incubator. Carefully replace half of the medium with fresh one every 2 days using 1 ml pipette. 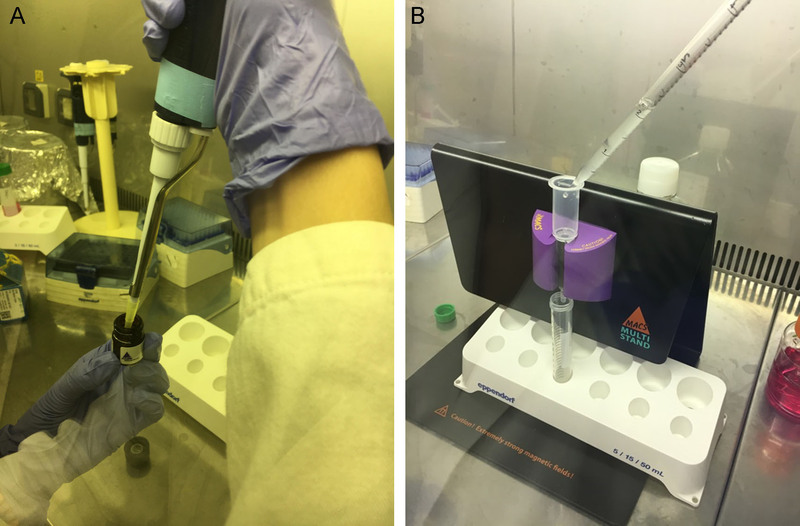 Plating dispersed cells from post-surgical human pituitary adenoma samples in stem cell-permissive medium promotes the enrichment in the culture of stem-like cells, through selective growth. 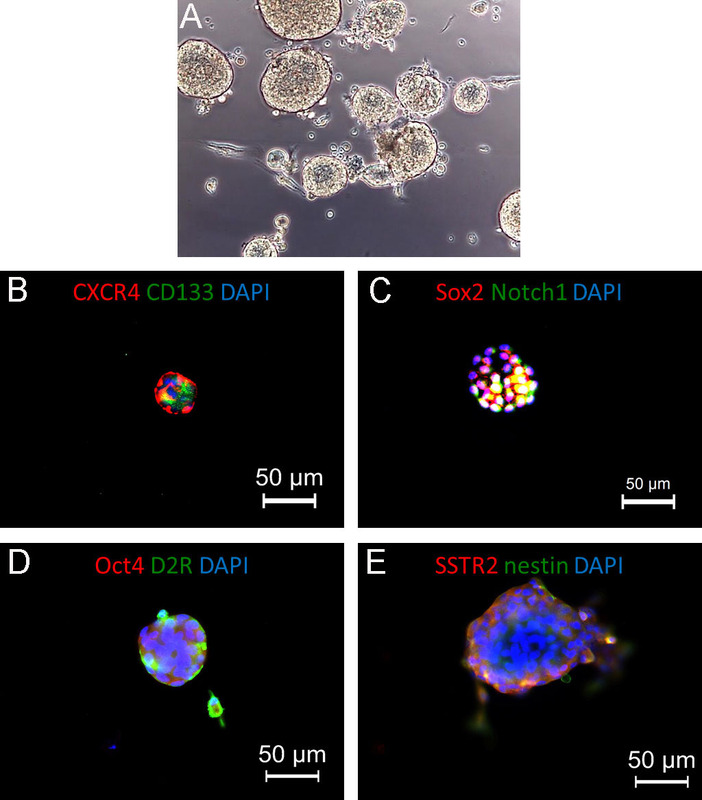 These cells indeed display cell division ability for several weeks, self-renewal potential (spherogenesis, Figure 3A), and stem marker expression (i.e., Sox2, CD133, CXCR4, nestin, Oct4, Notch1, Figure 4). Importantly, these populations continue to replicate in vitro, although at a low rate, for several weeks. Similar results can be reached by CD133-expression cell sorting on whole cell population, using immune-magnetic sorting (Miltenyi Biotec), although this selection may cause the loss of subpopulations of stem-like cells, which do not express CD133. Moreover, in our experience, the percentage of CD133-expressing cells can be very variable among adenomas. Conversely, plating cells from the same tumors in standard pituitary adenoma cell medium (containing 10% FBS, Recipe 3), instead, lead to the development of unselected cultures (Figure 3C), mainly containing non-stem cells, characterized by a limited in vitro cell survival. According to previous studies, it was estimated only about a single cell division in vitro. Post-surgical human pituitary adenoma samples are generally limited in size and therefore the number of viable cells obtained after this procedure could be dramatically small. Moreover, considering the low proliferation rate, the number of assays feasible from each culture is limited. Besides the in vitro characterization, the only parameter that operationally defines cancer stem cell is the ability to reproduce in vivo the tumors from which they derive. As far as pituitary adenomas, contrasting results were reported for the cells in mice, but recently, engraftment was reported in zebrafish embryos (Gaudenzi et al., 2017; Peverelli et al., 2017; Wurth et al., 2017). Figure 3. Bright-field pictures of primary pituitary adenoma cultures. A. Representative time-course of a primary pituitary adenoma stem-like culture: post-surgical human pituitary adenoma samples, after being dissociated to obtain single cells, are grown in stem cell-permissive medium. After about 1 week, stem-like cell start to duplicate, form large aggregates that eventually organize in cell spheroids. B and C. Representative pictures of primary pituitary adenoma cells, isolated from the same NFPA tissue, after 10 days in vitro in stem cell-permissive medium (B) and in standard pituitary adenoma cell medium (C). Original magnification 10x. Figure 4. Pituispheres generated from isolated human non-functioning pituitary adenoma. A. Representative bright-field picture of pituitary adenoma cells cultured in stem cell-permissive medium: cells are growing in suspension as pituispheres. Original magnification 20x. B and C. Representative immunofluorescence pictures showing the expression of stem cell markers (CXCR4, CD133, left, and Sox2, Notch1, right). D and E. Co-expression of stem cell markers (Oct4 and nestin, red) and regulatory pituitary receptors (dopamine receptor 2, D2R, and somatostatin receptor 2, SSTR2, green), suggesting the selection and in vitro expansion of stem-like cells from the original tumors. In all panels, nuclei are counterstained with DAPI. Resuspend detached cells in culture medium and transfer to 8-well chamber slides (around 10,000 cells/chamber). After 48 h, rinse the cells with PBS for 5 min and fix in 4% paraformaldehyde (Recipe 4) in PBS for 15 min at RT. Wash the cells three times in PBS for 5 min each at RT. Incubate the cells with 100 mM glycine (Recipe 5) in PBS for 10 min at RT. Permeate cell membranes with 0.1% Triton X-100 (Recipe 6) for 4 min at RT. Wash the cells twice in PBS each for 5 min each at RT. Incubate with normal goat serum (NGS, 10% in PBS) for 60 min to minimize the unspecific binding of the following antibodies. Dilute the primary antibodies in 2% NGS-PBS and incubate the cells overnight at 4 °C. Note: According to the analysis required in each individual study different primary antibodies can be used. In our initial characterization (see Wurth et al. 2017), we used the following antibodies: Sox2, polyclonal rabbit (Millipore) dil. 1:100; CD133, polyclonal rabbit (Abcam) dil. 1:100; Notch1 monoclonal mouse (Abcam) dil. 1:100; CXCR4 monoclonal mouse (R&D Systems) dil. 1:250; Oct4, polyclonal rabbit (Abcam) dil. 1:200; nestin, polyclonal rabbit (Abcam) dil. 1:100; D2R, monoclonal mouse (Santa Cruz Biotechnologies) dil. 1:100; SSTR2, polyclonal rabbit (Gramsh Laboratories) dil. 1:100. Examples of markers expression in pituispheres are depicted in Figure 4. Wash the cells twice in PBS (200 μl) each for 5 min each at RT. Note: From here all steps should be performed in the dark. Incubate the cells with 2nd antibody 1:500 (AlexaFluor) in PBS, 60 min at RT. Wash the cells twice in PBS (200 μl) for 5 min each at RT. Add DAPI for 5 min at RT. Mount with Mowiol (Recipe 7). Let the slide overnight flat in a horizontal position in the dark at RT. Note: One well without the primary antibodies should be included in all the experiments as a negative control. After one week in culture, collect the cells in a 15 ml tube, centrifuge the cell suspension at 300 x g for 5 min at RT, and discard the supernatant. Resuspend the pellet with 1 ml of TrypLE-express dissociation reagent and incubate the tube for 5 min at 37 °C. Add 10 ml of fresh PBS and centrifuge at 300 x g for 5 min. Determine the viable cell number by adding 1:2 0.4% trypan blue solution and using an automated cell counter (see Equipment). Seed 1,000 cells/well in three wells of MWs 24 in pituitary adenoma stem cells medium. After 2 min, take pictures from 4 random fields of each well. Monitor the cell growth every two days, isolated cells will generate spheroid aggregate. To demonstrate the persistence of self-renewal after long lasting in vitro culturing, isolated cells will generate secondary spheres: dissociate primary spheres and repeat Steps E1-E7. In order to quantify and monitor the self-renewal potential of human primary pituitary adenoma stem cells among the time (Procedure E), the number of spheres generated every 100 cells plated can be reported as sphere-forming efficiency (SFE) (Wurth et al., 2017). Proliferation activity can be assessed by cell counting using automated cell counter (Equipment #10) and analyzed for significance using statistic software (i.e., PRISM or similar). Differences in marker expression can be quantified using ImageJ software. This work was supported by the Italian Association for Cancer Research (AIRC). Authors have no conflicts of interest or competing interests to disclose. Carreno, G., Gonzalez-Meljem, J. M., Haston, S. and Martinez-Barbera, J. P. (2017). Stem cells and their role in pituitary tumorigenesis. Mol Cell Endocrinol 445: 27-34. Clevers, H. (2011). The cancer stem cell: premises, promises and challenges. Nat Med 17(3): 313-319. Donangelo, I., Ren, S. G., Eigler, T., Svendsen, C. and Melmed, S. (2014). Sca1+ murine pituitary adenoma cells show tumor-growth advantage. Endocr Relat Cancer 21(2): 203-216. Florio, T. (2011). Adult pituitary stem cells: from pituitary plasticity to adenoma development. Neuroendocrinology 94(4): 265-277. Florio, T., Thellung, S., Corsaro, A., Bocca, L., Arena, S., Pattarozzi, A., Villa, V., Massa, A., Diana, F., Schettini, D., Barbieri, F., Ravetti, J. L., Spaziante, R., Giusti, M. and Schettini G. (2003). Characterization of the intracellular mechanisms mediating somatostatin and lanreotide inhibition of DNA synthesis and growth hormone release from dispersed human GH-secreting pituitary adenoma cells, in vitro. Clin Endocrinol 59: 115-128. Li, Y. and Laterra, J. (2012). Cancer stem cells: distinct entities or dynamically regulated phenotypes? Cancer Res 72(3): 576-580. Molitch, M. E. (2017). Diagnosis and treatment of pituitary adenomas: a review. JAMA 317(5): 516-524. Peverelli, E., Giardino, E., Treppiedi, D., Meregalli, M., Belicchi, M., Vaira, V., Corbetta, S., Verdelli, C., Verrua, E., Serban, A. L., Locatelli, M., Carrabba, G., Gaudenzi, G., Malchiodi, E., Cassinelli, L., Lania, A. G., Ferrero, S., Bosari, S., Vitale, G., Torrente, Y., Spada, A. and Mantovani, G. (2017). Dopamine receptor type 2 (DRD2) and somatostatin receptor type 2 (SSTR2) agonists are effective in inhibiting proliferation of progenitor/stem-like cells isolated from nonfunctioning pituitary tumors. Int J Cancer 140(8): 1870-1880. Schettini, G., Florio, T., Meucci, O., Landolfi, E., Grimaldi, M., Lombardi, G., Scala, G. and Leong, D. (1990). Interleukin-1-beta modulation of prolactin secretion from rat anterior pituitary cells: involvement of adenylate cyclase activity and calcium mobilization. Endocrinology 126(3): 1435-1441. How to cite: Würth, R., Pattarozzi, A., Barbieri, F. and Florio, T. (2018). Primary Cultures from Human GH-secreting or Clinically Non-functioning Pituitary Adenomas. Bio-protocol 8(7): e2790. DOI: 10.21769/BioProtoc.2790.